We found the café by wandering along the pretty pedestrianized streets in Fort Collins. Once we spotted it, we couldn’t resist the signage outside noting it produces 100% of their produce from scratch. I’d like to point out at this stage that the pumpkin latte wasn’t mine. I might be a white female, but I’m not a stereotype when it comes to beverages. I like my coffee to taste like coffee. Les, however, was bucking the trend completely by being possibly the first ever non-white man to buy a PSL. I jest, of course, I’m sure he’s not the only one. Anyway, in case you were wondering, it was the hand made apple cider muffin that was teamed up with the pumpkin latte which made it so special… allegedly. It was excellent, though, but it went just as well with my regular cappuccino. I sat in the window counter and watched locals waking their dogs; going for a morning run; and wandering around town on a sunny Saturday morning. The service was a touch chaotic during the time we were there, but I assumed it was down to the fact that it was busy. Still, it was a really lovely place to relax and indulge in a spot of people watching in down town Fort Collins. And what a location to do to in. One of the things I particularly liked about the café was their ‘community table’. This was a larger table, seating six persons, which was specially designated to bring customers together and encourage them to chat. Sitting across from us, at a table on her own, was an older lady who appeared to be studying. She was reading and making notes, while eating a pastry and drinking her coffee. I would LOVE to have a neighbourhood coffee shop like this to sit in and write on a sunny morning. Unfortunately, we don’t have so much sun in Wales, unfortunately. Maybe indulging in some premium coffee and a change of scenery would make me look as contented as the residents of Fort Collins. 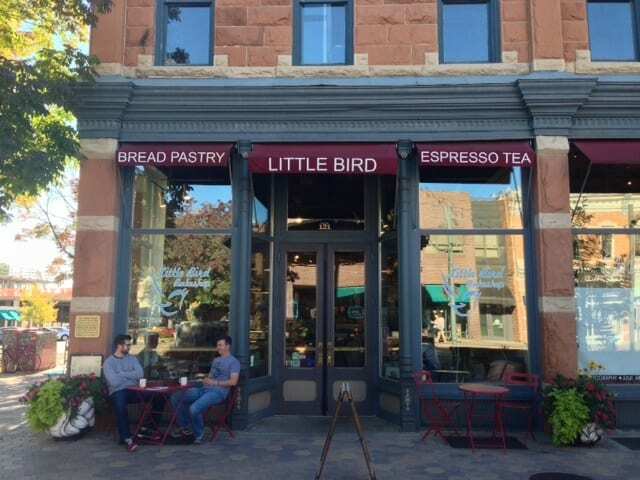 Have you visited Little Bird Bakeshop in Fort Collins?